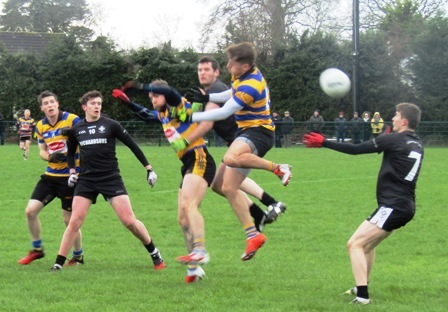 Walterstown travelled to Kilcloon on a chilly Sunday morning hoping to reverse their result in round one and come back to Oldtown with a win. There were two changes to the starting line up from the previous match with Ciaron Murphy and Sam McCabe included in the starting 15. Walterstown were the brighter in the opening stages of the first half, with Brian O Connell registering the first two scores of the game with a placed point and one from play. Blackhall almost scored a goal 10 minutes in but John Davis produced a fine save to deny them. 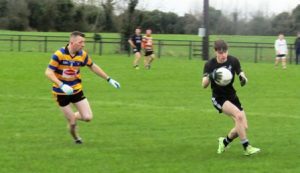 Blackhall were to edge in front through three frees before Walterstown made a change, with John Geoghegan replacing Sam McCabe. Some clever play from the Walterstown forwards set up Joey Coogan to score the only goal of the game with 5 minutes remaining in the first half. That was to conclude the scoring for the first half and the visiting team went in at the break with a two point lead. After the break defender Colm Reilly scored his second point in two games to cancel out Blackhall Gaels first point from play. Ciaron Murphy received a black card 10 minutes in and was replaced by Colin McGrane, who was returning to action after a lengthy spell put through injury, and Stephen Davis replaced Joey Coogan. Blackhall then had a period of dominance and scored three successive points to take the lead. This period of dominance swung towards Walterstown in the final ten minutes however, as points from Conor O Sullivan, Aron McLoughlin, Alban Crosbie and David Donnellan gave Walterstown a three point lead. It had been a very scrappy and hard fought game throughout with referee Rodger Tobin brandishing several yellow cards , and in a heated final few minutes both John Geoghegan and Mark McCormack saw red as 13 man Walterstown held out for a much need win. Line Up : John Davis, Aaron McLoughlin (0:01), Conor Cullen , Colm Reilly (0:01) , Mark McCormack (R), David Donnellan (0:01), Ciaran Murphy , Conor O Sullivan (0:01), Alban Crosbie (0:01(F)), Sam McCabe, Barry O Connell , Adam Treanor, Conor Farrelly, Brian O Connell (:02(1F)), Joseph Coogan (1:00).